The intrepid explorer Congo Bill, who had first appeared in More Fun Comics#56 got his own title in August 1954. Along with his leopard -skin clad sidekick Janu, Congo Bill protected Africas people and wildlife from exploitation. Later, Bill would become the super hero Congorilla by transferring his consciousness to the body of an ape called the Golden Gorilla. 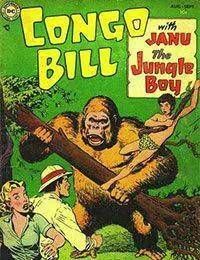 Although Congo Bill only lasted 7 issues, it set the stage for Congorilla and Golden Gorilla story lines that would unfold across different titles over the next few decades.